Invested. Photo Credit: Mechelle Avey. Alwaysuttori.com. September is almost over, but we’ve got a couple more Slay-the-Books Looks to share. This 4th STB look is all about maintaining ready-for-anything style when you need it most — say a dreaded class presentation, or, better yet, a group project with the hottie two rows over. Truthfully, for the INTJ, fashion isn’t really about being fashionable for fashion’s sake. It’s about defining and reflecting identity through the way we dress. We’re not talking about flaunting fashion labels from over-priced brands, nor sporting an “in” crowd uniform. To make fashion worth the effort, INTJs have to let fashion feed their sense of possibility, allowing it to reflect the INTJ’s rich inner world. Of course, when you’re in high school, it can be difficult to let your true self show. Sometimes, even INTJs need the approval of their peers. That’s why having an STB look in your arsenal is so very necessary. If you’re going to be trapped for the next 9 to 10 months in a building filled with numerous other cognition styles—and, if you’re lucky, maybe a few other INTJs—there will be times you need to dress in a way that let’s your outfit do the talking; especially during those times when discretion is the better part of valor. 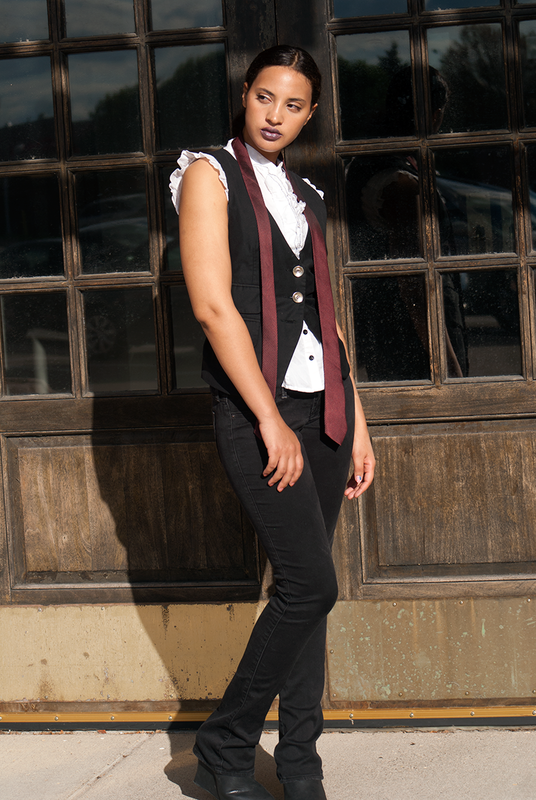 This menswear inspired look fits the bill. Lately, we’ve talked a lot about gender, and the ways in which male INTJs express their cognitive functions differently from female INTJs. 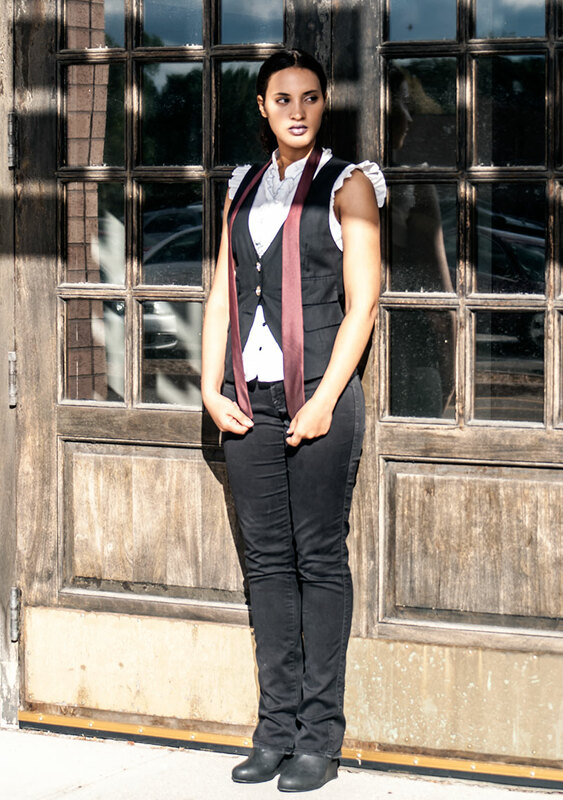 Whether it’s actually true or not, sometimes, it feels as though dressing like the boys can increase your swagger quotient (whatever that is). The thing I like about this look is that it takes the best of both male and female traits and combines them in a seamless, yet feminine, way. Realistically, this is more menswear inspired than actual menswear. 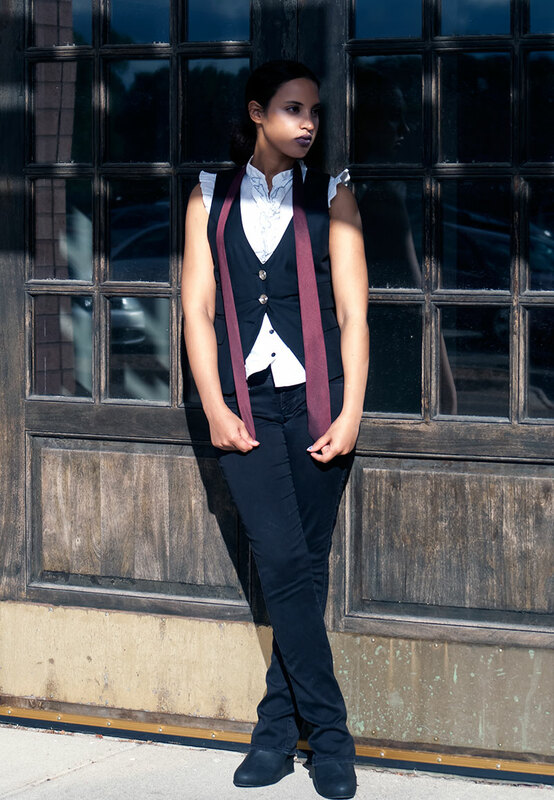 The touch of ruffle on the front and arms adds a bit of flirty femininity, which balances out the masculinity inherent in the vest and black, cotton pants. Menswear is one of my favorite styles. I don’t know if it’s because of the tom-boyish nature of INTJ cognition, or if it’s merely an aspect of my own personal aesthetic. Still, give me a sharp blazer or vest, a crisp, white shirt, and an Oxford shoe, and I start drooling. Unfortunately, menswear styles marketed for women can be pretty expensive. That’s why this look is made up of inexpensive items purchased at different times. As for the tie, it was free. I snagged it from my brother. That’s super easy. It’s black and white. We INTJs love the neutrals, especially black, don’t we? Ultimately, this is just a simple outfit with hints of menswear. It is more feminine than masculine, but the more masculine aspects of the look complement the femininity, giving the look a solid foundation. A good foundation is all anyone really needs to get schooled.